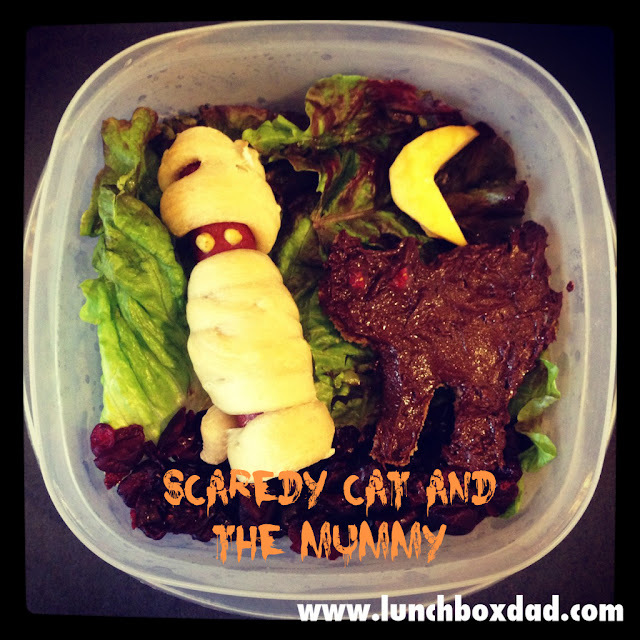 Scaredy Cat and The Mummy: I am part of a Halloween lunch blog hop this Thursday so you will be able to see my new Halloween lunch then. Believe me you won't want to miss this blog hop. You will be able to get so many ideas for kid's lunches, Halloween parties, and much more. I will have a new post Thursday morning and will be reminding you about it over all my social media networks, so please check in on Facebook, Twitter, or any other sites I have listed. Until then, I thought I would repost one of my Halloween lunches from last year. This was fun and easy. To see the original post with the recipe click HERE. See you Thursday! Super cute.. looking forward to your hop lunch! Looking forward to your Halloween lunch blog hop! Thanks Karen, I had fun with it and I can't wait for the blog hop. Hahaha we did the same thing making a cat with that cutter and covering it with chocolate spread and giving it eyes of some sort of candy. (Mine were yellow confetti sprinkles) XD Adorable! Thanks! Yeah this was from last year so I didn't have any cutters yet, the cat was freehand with Nutella fur and strawberry eyes.